Skye Gravestones | Neil & Euphemia (Macpherson) Anderson, s. Donald. Neil & Euphemia (Macpherson) Anderson, s. Donald. Erected/by/Capt JOHN ANDERSON Ullapool/in memory of his father/NEIL ANDERSON Tarskavaig/who died 2nd Feb. 1846 aged 81 years/and his mother/EUPHEMIA MACPHERSON/who died 6th February 1814 aged 39/also his brother/DONALD who died 1813 aged 9. 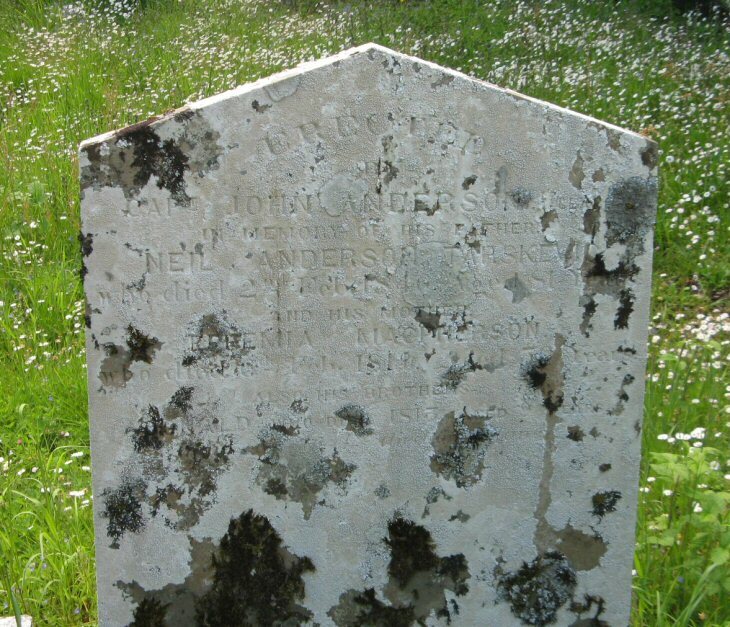 I am a descendant of Neil Anderson and his second wife, Catherine Beaton, who died at Tarskavaig on 8 May 1857? I would like to locate her grave if possible. I would be interested to hear from anyone who knows where her grave is located and if there is a headstone. Also, I have been to Kilmore churchyard in search of Neil's grave but could not find it. Am I looking in the right place? comment posted 29 June 2016. I am currently visiting from Australia. Added by Dianne Veitch on 28 June 2016.